The beauty and attraction towards cantilever umbrellas in Sydney are their rotating properties. In this aspect, there is perhaps none better than the SU4 Rotating & Tilting Umbrella by Ashadya Shade Sails & Blinds. The SU4 Cantilever Umbrella offers 360-degree rotational flexibility for maximum shade and convenience. It has been designed and manufactured to be used in coastal environments using marine grade components such as an aluminium frame and stainless steel hardware. The SU4 Cantilever Umbrella will complement and enhance any outdoor setting and can be successfully installed in almost any environment. It is available in a wide range of colours and can be installed with an in-ground anchor, surface place or a portable base. We have a number of diagrams available upon request. As with all umbrellas in our outdoor umbrella range, the SU4 uses quality solution-dyed fabrics suited for commercial applications. 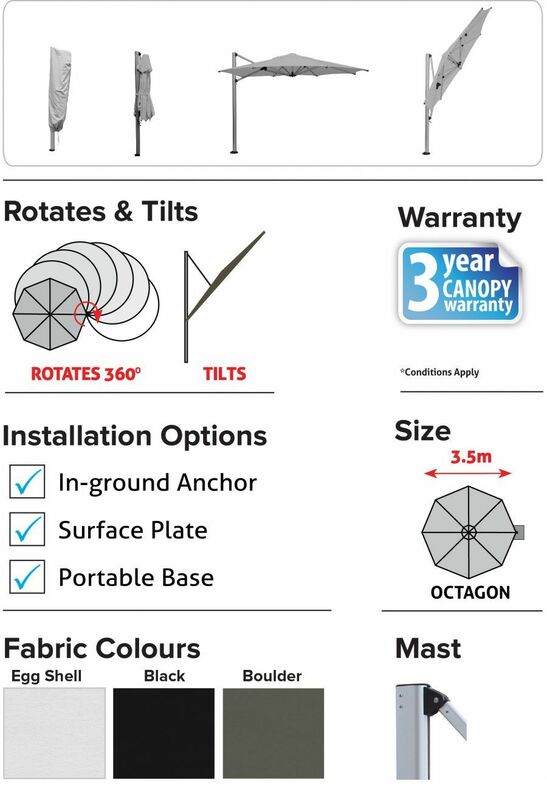 If you live in Sydney, or the surrounding areas of Hills District, North Shore and beyond, and would like more information on our S4 Cantilever Umbrella, contact Ashadya – call 1300 570 901 today.